We've collected our favorite jokes. It was all jokes and a just sentence or two of sentimentality from the president, hitting many political notes and every presidential candidate. And how well did his jokes land? Judge for yourself below. 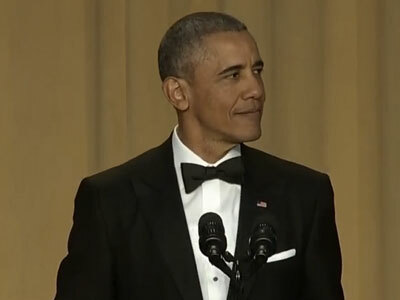 It is an honor to be at my last, and perhaps the last White House correspondents dinner. You all look great. The end of the Republic has never looked better. And yet somehow despite all this, despite the churn, in my final year, my approval ratings keep going up. The last time I was this high, I was trying to decide on my major. “What has changed, nobody can figure it out,” he says as a split screen photo of Ted Cruz and Donald Trump appears on the screen. I love Joe Biden, I really do. I want to thank him for his friendship, for his counsel, for always giving it to me straight, for not shooting anybody in the face. I also would like to acknowledge some of the award-winning reporters who we have with us here tonight: Rachel McAdams, Mark Ruffalo, Liev Schreiber. As you know Spotlight is a film, a movie, about investigative journalists, with the resources, and the autonomy to chase down the truth, and hold the powerful accountable—finest fantasy film since Star Wars. GOP Chairman Reince Priebus is here as well. Glad to see that you feel that you’ve earned a night off. Congratulations on all your success. The Republican party, the nomination process, it’s all going great. Keep it up. [After acknowledging former New York City mayor Mike Bloomberg] Mike, a combatant, controversial New York billionaire is leading the GOP primary and it is not you. That has to sting a little bit. Although it’s not an entirely fair comparison between you and the Donald. After all, Mike was a big-city mayor, he knows policy in depth, and he’s actually worth the amount of money that he says he is. What an election season. For example, we have the bright new face of the democratic party here tonight, Mr. Bernie Sanders. Bernie, you look like a million bucks. Or, to put it in terms you’ll understand, you look like 37,000 donations of 27 dollars each. I am hurt, tough, Bernie, that you’ve been distancing yourself a little from me. I mean, that’s just not something you do to your comrade. I’ve said how much I admire Hillary’s toughness, her smarts, her policy chops, her experience. You’ve got to admit it though, Hillary trying to appeal to young voters, it is a little bit like your relatives who just signed up for Facebook: Dear America, did you get my poke? Is it appearing on your wall? I’m not sure I’m using this right. Love, Aunt Hillary. Meanwhile, on the Republican side, things are a little more, I’m not sure how we say this, a little more loose. Just look at the confusion over the invitations to tonight’s dinner. Guests were asked to check whether they wanted steak or fish, but a whole bunch of you wrote in Paul Ryan. That’s not an option people, steak or fish. You may not like steak or fish, but that’s your choice. Meanwhile, some candidates aren’t polling high enough to qualify for their own joke tonight. The rules were well established ahead of time. Ted had a tough week. He went to Indiana. Hoosier country. Stood on a basketball court and called the hoop a basketball ring. What else is in his lexicon? Baseball sticks? Football hats? For sure, I’m the foreign one. Nah, I’m just kidding. You know I’ve got to talk about Trump. Come on. We weren’t just going to stop there. Come on. Although I’m a little hurt that he’s not here tonight. We had so much fun the last time. And it is surprising. You got a room full or supporters, celebrities, cameras, and he says no. Is this dinner too tacky for the Donald? What could he possibly be doing instead? Is he at home, eating a Trump steak? Tweeting out insults to Angela Merkel? What’s he doing? And there’s one areas where Donald’s experience could be invaluable. And that’s closing Guantanamo. Because Trump knows a thing or two about running waterfront properties into the ground. I don’t want to spend too much time on the Donald. Following your lead, I want to show some restraint. Because I think we can all agree that from the start he’s gotten the appropriate amount of coverage befitting the seriousness of his candidacy. I hope you all are proud of yourselves. The guy wants to give his hotel business a boost, and now we’re all praying that Cleveland makes it through July. The president presses two fingers to his lips, and drops the mic.